AnonD-34934, 26 Mar 2013n9 will connect with all bluetooth device.. Unless they have restrictions.. So u better as thi... moreso you mean i can use any device which has higher and lower version of bluetooth? i hope i can connect this 3.0 version to my 2.1 +EDR nokia n9! !, anyone here who can answer my query? answers are highly appreciated, by the way thanks bharani, i will try your suggestions!! AnonD-129142, 26 Mar 2013hello guys, i have nokia n9, and i wanted to buy iphone mini bluetooth headset, i just want to... moren9 will connect with all bluetooth device.. Unless they have restrictions.. So u better as this question to any iPhone user.. They will surely give u proper answer.. Type ur question in iphone 5 discussion page in gsmarena..
hello guys, i have nokia n9, and i wanted to buy iphone mini bluetooth headset, i just want to ask if this thing will work? the bluetooth version is 3.0 +EDR, will this be compatible with nokia n9?please help thanks!! loolla, 20 Mar 2013i think its great phone but it seem that there is a bettry problems, i have to recharge every ... moreYou probably flashed the phone with wrong version. It did the same thing to me before. dezider, 25 Mar 2013i want to buy this phone but i need to be really sure about it..can i make a bookmarks in web ... moreYou can make bookmarks (which otherwise work normally) on the applications screen, but not in the browser itself, when using the default browser. Firefox uses bookmarks in-browser if you prefer that. There's no noticeable difference in speed between the 16 and 64GB versions, if that's what you mean. Both run very well for the specs, though the phone's obviously 2 years old now. please tell me what is the Nitdroid means and what i can do with the nitdroid.plz answer me. Pauline, 22 Mar 2013Does anyone have difficulty hearing their 'phone ring? I have taken it back to the shop and th... morefriend don't get angry for this.... U are sad abt the loudspeaker performance.. Just have a look into any android smartphone user opinion in gsm arena, they face problems in both os and hardware.. There everything looks superior to our device hardware but think abt the performance and battery backup.. 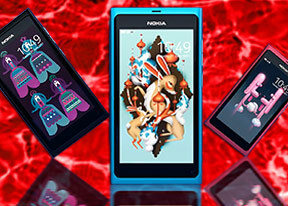 Here many N9 users are also facing some problems with their devices.. Compared to those this may not look like a big issue.. Feel happy that u r having a completely diff phone running different os with out too many lag.. Even my friends S3 hagh but not my N9.. Also i too have used other platform devices in-between. But i was forced to get back to this unicorn.. This still stays fluid and strong... Just enjoy to be a n9 user.. Pls forgive me if this is not upto ur acceptance..